Matt has worked in research, media planning, Video-On-Demand and scheduling for Turner, Disney and Nickelodeon. 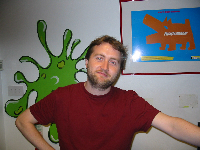 Today he manages the strategy and day to day Programme Planning for Nickelodeon’s UK channels. Matt became a father in 2011, and finally has a genuine excuse to keep his Sky Plus box filled with TV shows made for an audience 30 years younger than him.